Every year a bright blue line suddenly appears on streets all over the city of Akron. Many wonder why it's there but in the running community, "big blue" gets a lot of juices flowing. The 26.2-mile-long (or 138,336 feet) blue line is a favorite tradition of the Akron Marathon which steps off Saturday at 7 a.m. It takes a team of Akron city workers to paint the blue line just right, throughout various Akron neighborhoods. 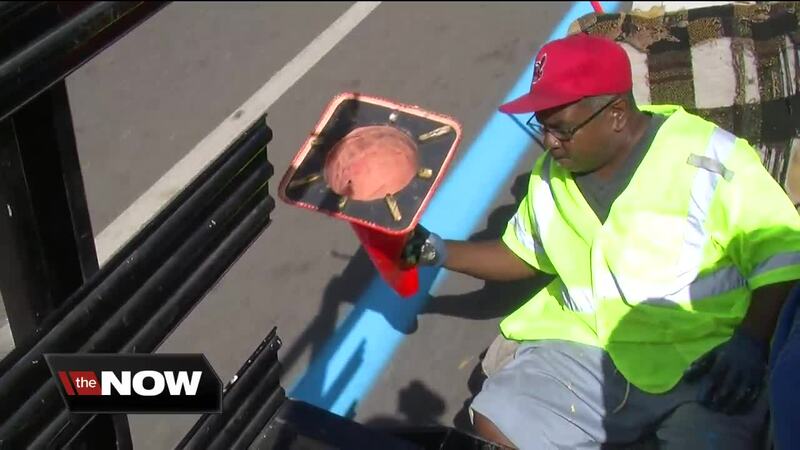 A mixture up to 120 gallons of white paint is mixed with a blue dye and loaded onto a truck, which has been driven by Juan Jones all 16 years of the marathon. Without fail, Jones gets strange looks from drivers. "We had a guy. We were just painting coming down. He was like, 'Hey man, why you painting blue?' I said, 'It's the marathon!'" Ahman Grandberry sits near the edge of the truck as one of the sprayers. The pressure is on to make sure he keeps the line straight. After all, he doesn't want to be responsible for sending 10,000 runners the wrong way during a marathon. "You got the scope, then you got the wheel and everything has got to be lined up before you hit that button. You got to make sure it's lined up because if it's not, it's gonna be a mess and it ain't gonna be straight," Grandberry said. Workers on a second truck follow the paint truck and carefully drop orange cones on the blue line to keep drivers away until it dries. A third vehicle brings up the rear and serves as a lookout for the job that can take up to three days. During a recent Facebook Live post, Akron Marathon Race Director Brian Polen rode on one of the trucks and praised the crew for their work on the legendary line. "People will be training on this blue line 365 days a year," Polen said. After the paint job is done, the work is not over for the crew. On marathon day, they return to their trucks and follow the runners all the way to the finish at Canal Park. "We're the last ones in line, so we're really the losers, I guess," Jones joked. "We follow the last person and pick up all the cones afterward." The blue line is a motivator for Akron marathoners fighting to get to the end and maybe even an inspiration to Grandberry who is thinking about lining up at the start of it one year. "Made me want to do it. Made me want to try it," he said. "Probably in the future. I don't know. 26 miles is a lot."